Hull Street / Winterpock Rd. Made in Asia shares a large parking lot in the shopping center we are located in. And also limited parking in the front of the restaurant along the strip. There are entrances in the back, and the front of the restaurant. No occasion is too small or large for fine catering. Made In Asia can cater to any occasion. Whether it be a cocktail reception, office lunch or a birthday party. All menu selections area available and customizable. We can also create other gourmet cuisines exclusively for your event. Everything is prepared with quality and presentation in mind. 'We will assist in making the best selections for your event type and guest amount. We also offer any serving utensils and condiments you may need. Complementary delivery service is available depending on order and distance of event location. For a casual yet elegant restaurant that serves inspired Thai and pan Asian cuisine, visit Made in Asia located in the heart of Chesterfield, Virginia. Made in Asia offers an extensive menu of favored Asian items and delicacies that consist of fresh ingredients prepared to order. Enjoy items such as pad thai, drunken noodles, curry fried rice, beef pad pak, General Tso�s chicken, grilled tofu, spring rolls and Buffalo wontons. A sushi and raw fish bar is also available at Made in Asia. Guests can enjoy combination rolls that include maki selections such as salmon, eel, shrimp tempura, sweet potato, spicy tuna and more. The food was good, big menu is large a lot to chose from, but the best part was the service. When people go out of there way to make sure you have a good experience it makes a difference. Shelby was was our server and when I told her I have fish allergies she watched out for me by talking to the staff in the kitchen and other servers about menu choses I could make. Even making the kitchen staff change gloves and wash the tools they use to make my dinner. We love this restaurant. Their food and friendly staff make it a great place for date night or a family meal. Very nice atmosphere and very friendly staff. Our waitress was attentive and knowledgeable. The food was very good - bang bang shrimp for her and a 2-roll sushi plate for me. Good prices and good portions. I was expecting a little more for dinner on New Year's Eve. There were no specials offered at all. Food was good as usual, however, the bang bang shrimp came to the table with no scallions. The waitress said " we are out of scallions". Really.... there is a walmart less than 5 minutes away. I just do not feel that the restaurant was prepared for the evening at all. When we first got to the restaurant, they were not really sure if they had our reservation or not. Was told the Open Tabke reservations do not work at their facility. Did get seated. Waited 15 minutes to be recognized. Waitress who did assist us was really good. Took an hour for our food to arrive because it was made incorrectly. Should have been informed. May try again, but it will be awhile. 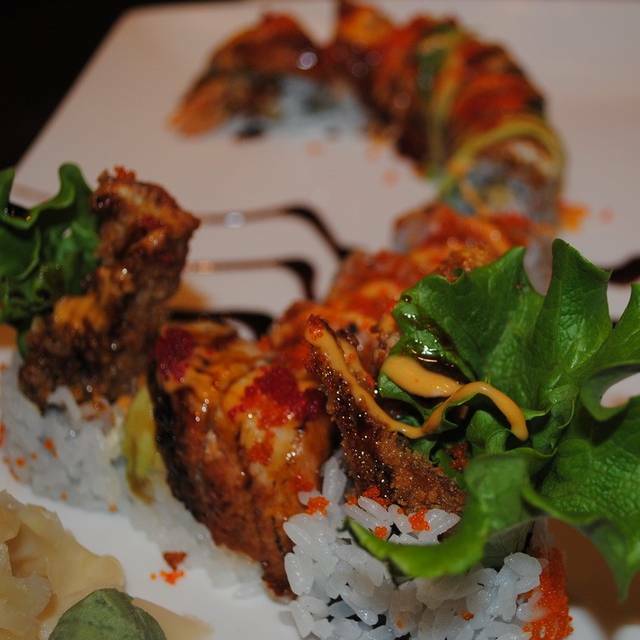 Food is great, the specialty sushi rolls are amazing. The only negative feedback is the amount of wait staff was limited. Luckily we had a 5pm reservation because there was a long wait due to lack of wait staff to handle the crowds. Food was very good and valued priced. Server was excellent. First time here with my husband. Food and service was great. Loved that they offered a large Gluten Free menu! Had a work function and they handled large party very well. I have been here several times. The food and service are excellent for the reasonable price point. Frankly this is the best restaurant in the Hull street area. This is one of my favorite sushi restaurants in the Richmond Metro area. The sushi and our entrees were excellent. The service was very good but they were short handed and it was a little slow. Limited wine menu. As always the food was excellent and the service helpful and friendly. We dined with an out-of-state friend who was impressed with the menu and her dinner. Always very consistent quality of food, great variety. We were very fortunate to get 7 people in on a Friday night. Our meal was quite good. I ate lightly with chicken lettuce wraps and wonton soup. The wraps were nothing like the lettuce wraps served by pf Chang and others but were well received and likewise enjoyed. Our waitperson Karen was attentive and well informed. The food came out in an timely manner and I would recommend MIA without hesitation. Food was great, service was very slow. We ordered the $40 sushi special and it was excellent. Good selections, expertly prepared. Service was excellent (Thanks, Emma). We had a nice Pinot Grigio that paired well. The desert choices are very good for an Asian restaurant. Good food, great service, nice local place for a unique Thai meal. Has outdoor seating, but didn't use this time with the temperature in the low 10's. Will have to try the outdoor seating in the summer. Looking forward to my next meal there. We have been here many time and have always had a good experience. Tonight was not and it made me take a closer look at the food and service. The sushi was just average, no “wow” factor and not much flavor. The sushi here is well below the standard in the area. We also had salmon (dry) and shrimp with vegetables. The service was slow and they seemed under staffed. Probably won’t be back for awhile. Was seated promptly upon arrival but then waited over an hour for our main dish. Not acceptable. They were busy but tables not completely full. Waitress was nice and slowness of food not her fault. They offered us a coupon to comment back. Would have preferred they discounted our dinner that night. We made reservations via Open Table, arrived 5 mimutes early, got seated within a couple of minutes. And that's where the service stopped. Waited for 20 minutes, no one payed any attention, not even water offered, never mind any other drinks or orders. Then, a passing by waiter asked if we were being helped - the answer was "not yet", he left and never came back or sent anyone. After another 10 minutes of fruitless wait, we got up and left. And had a wonderful dinner in a nearby Boathouse restaurant. Food was great. Atmosphere is always nice. This trip, it took forever to get drinks. It took 10 minutes to get an Apple Saki and a ginger ale after we were seated. Refills took 20 minutes to get. Server could have been more attentive. This is one of my favorite spots in Richmond. I recently had the chance to take some out-of-town friends in for a visit. They are sushi lovers and were very impressed. The service is always outstanding. Delicious food - friendly staff. Very good Sushi menu. Service was fair but the food was good. This is my favorite Asian restaurant in Chesterfield County. The food is always very good with generous servings. The wait staff is knowledgeable and friendly but not overly chatty. The sushi is excellent with many choices and fresh fish. I wish they were more creative in preparing the sushi like some other Asian restaurants in the Greater Richmond area. But the sushi is always very good. We thought we had made a reservation, but when we arrived we were told that it was not really a reservation, but our name was on the "priority seating" list and the wait was currently about 30 minutes. Usually with Open Table you make a reservation, so it should be more clear that at Made in Asia it is not really a reservation. Have dined here on many occasions and our waitstaff was outstanding without being overbearing. Stephanie (?) was articulate, polite, knowledgeable, and attentive. Her demeanor only enhanced an otherwise wonderful meal. I liked so much - I went twice in one week! Great food. Great price! My wife and I enjoy having dinner here. Our first time at Made in Asia - it definitely won't be our last!! We had a great server (unfortunately, I can't recall his name) who was attentive and helped pace our meal very nicely between courses. We had an appetizer of Crab Rangoon, and shared some sushi (the Chesterfield). I had the Pad Thai and my husband had a Curry dish with shrimp and green beans (at our server's recommendation). Both were fantastic! The atmosphere was modern in black and white and just really unexpected in a strip mall location. The owner, Holly, chatted with us for a few moments to see how we were doing. We will be going back soon with a gift card we received and are really looking forward to it. I think you'll be pleased as well. Great service and very flavorful appetizer and entree. Surprised by overall experience. Nice neighborhood oriental spot. Interesting menu. Decor minimal but very tasteful. Booths and tables separated from bar, yet open sightlines to that scene. Service was somewhat erratic. Above the normal chinee. Never disappointed when dining at this hidden gem. High quality unique dishes. The best sushi in town prepared fresh at the time of the order right in view. The service was unusually slow. Our food took much longer than normal to come to the table than normal. It was just as delicious as normal but much slower. If you are looking for a unique asian food experience with primo sushi, this is the place. Great appetizers, but our entrees were very disappointing. First time visit. Justin the waiter was very good. Knew his menu. Had curry entrees and both were very good. The beef was tender. Next time we will try sushi. Fresh decor. Martini was very good!